I’ve been to the Viking Museum Lofotr for over one month now. There I have been making quite a few items which I’ll post over the next weeks. PS! A warning for the purists: These things are not made with stone tools only. 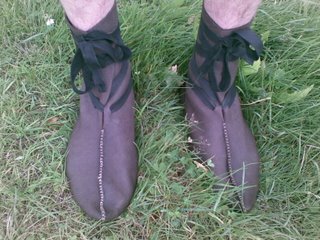 The shoes were made on an evening course run by viking era shoe maker Fanny Larsson (she makes shoes on order for those who are interested). Though they are a little too big for using without woolen socks they are very comfortable. The pattern is taken from Hedeby, currently in Germany, but formerly in Denmark. I’ve used these types of shoes and my bare feet only now for almost 5 weeks straight and the 2 times I’ve tried on my modern shoes it has been an awful experience. I gathered a lot of birch bark for personal projects and courses while I was at home. Some is spirally cut and will be used for a rucksacks or shoes. This is a photo of some of it. All was gathered with stone tools. This cup was made due to the need of a container to keep my worms in when fishing. This type of cup is readily made and discarded and can be used for drinking from too, but due to the simple fold it does not hold water perfectly.